Item shown above : Natural Hardwood - MAHOGANY FINISH with black color felt background. (mini helmets sold separately). DisplayGifts line of high quality wooden cabinet. The display case holds 16 Riddell Helmets. 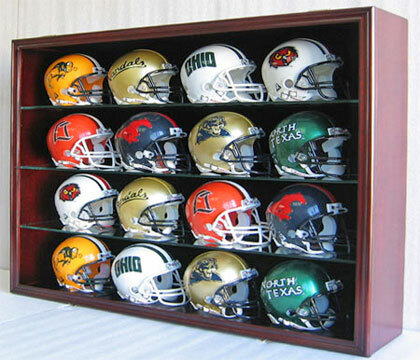 Carefully crafted from solid wood, this display case would be perfect to showcase your collection of mini helmets. When hang on the wall it is just like a piece of art itself. It has a hinged Acrylic door to prevent inquisitive fingers. The hinges are on the top of the display case and the door latches are on the bottom. The wooden shelves are removable. Wall brackets on the back of the display case for wall mounting. Built-In Lock with key. No assembly required.